So the White Queen implores Alice to learn how to believe the impossible: close your eyes and try really hard to ignore the obvious and disregard reality. This picture is a perfect description of how many secular humanists view Christians today – blindly wishing that what is obviously not real is real. Wishful believing in fanciful tales. When Augustine wrote The City of God he lived among people who believed in almost everything and anything – they had plenty of practice in believing what we would think impossible. Augustine takes a pragmatic and rational approach – asking whether the gods can deliver on what they promise, and whether the lives of the followers match their beliefs. It is to Marcus Varro that Augustine turns in chapter 6 of City of God in order to refute the notion that the superstitious worship of these pagan gods had any eternal benefit. In his first five chapters he has already argued that the Roman gods cannot provide benefit in this life, but perhaps we should still acquiesce to them for future blessing in the life after death? Marcus Varro was the Richard Dawkins of his day, an intellectual powerhouse, an articulate scholar and a renown academic. He is described by Terentianus Maurus as “that man of universal science”, a man who, like Hitchens, “wrote so much that we find it hard to believe that anyone could have read it all”. Back in the first century BC Varro wrote a treatise on the Roman gods; rather than attack these gods, he sought to rescue them from the mire of cultural confusion. He was the ancient popular science author, whose books would have topped the best seller lists in Constantinople and Carthage. It is important to remember that at this time people believed that the gods were intimately connected with every aspect of life. They interacted with the gods in three spheres of life, defined by Varro as the mythical, physical and civil. Augustine reframes these categories as the fabulous (from fable), natural and civil. The fabulous is the area of the poets and plays, the natural is the philosophers and the civil the general public. Indeed, Varro States that “the first type of theology is particularly suited to the theater; the second is particularly concerned with the world; the special relevance of the third is to the city”. Augustine then quotes from Annæus Seneca, who observed about the Jews that “those, however, know the cause of their rites, whilst the greater part of the people know not why they perform theirs.” He says, in effect, at least the Jews knew why they did things, the general public didn’t really understand, they just followed custom. Surely this is the heart of the matter – in a world without absolutes who decides what is rational and what is superstitious? We look back at these people all those years ago as superstitious and the atheists look at us today as superstitious. And in the middle are those thinkers who call us back to reason. 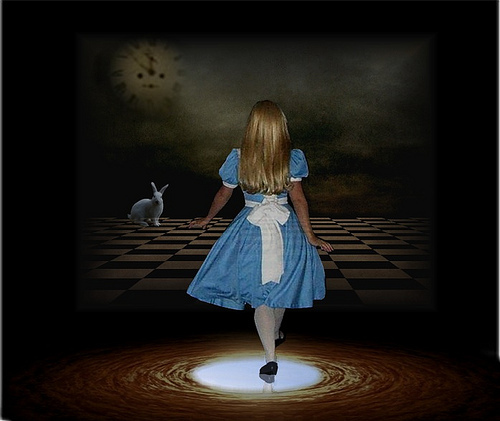 Augustine is arguing from first principles – and like Alice he is seeking to expose the impossible inconsistencies in our belief and practice. Back in those days the Jews and Christians were the “rational” ones – understanding what they believed and why, and following these beliefs. The majority of society were carried along on a wave of beliefs they inherited but never questioned. But we would never be so foolish…would we? Whether we believe in one God or none, or thousands, do we know why we believe what we do? Do we live in such a way that is consistent with our beliefs? The superstitious are those who unthinkingly follow the crowd and pour scorn on those who differ. May we be people of conviction who know why we believe what we believe, and may we follow through with our beliefs in a world that needs to see Christian’s with a reasonable faith.